On leaving Moron, we ran into Bernard. We thought we might, so kept a lookout. We had a chat on the side of the road and went our separate ways. 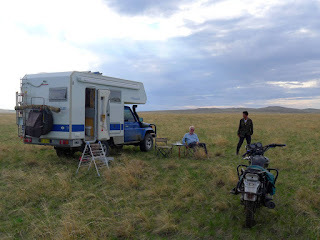 We headed south towards Kharkhorin with an overnight camping spot in the middle of nowhere. 2 blokes on a motorbike arrived with a mob of horses. The horses went to the small lake for a drink, so we offered the guys some Chacha (Georgian grappa). It’s all we had. 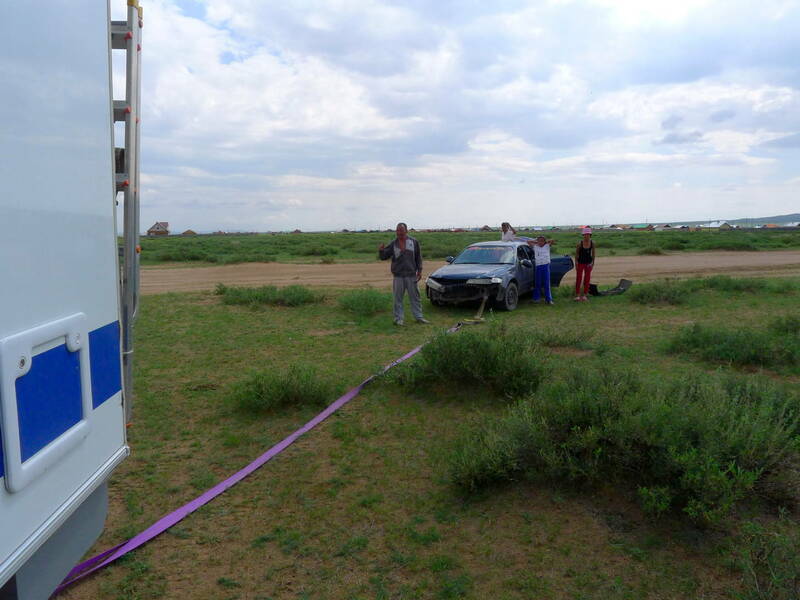 “Mongolians will drink anything” said Lawrence. Well, the look on their faces was priceless. Chacha has a very strong taste and of course they are used to vodka. It was quite funny – they declined seconds. It’s really awful stuff, not even Lawrence will drink it very often. Locals arrive to stare at you out of nowhere. Next day we set off early after a bad night’s sleep and ran into a family having car trouble. They had a broken timing belt, and weren’t going anywhere. To quote Lawrence “the engine’s f*ck*d”. Near the end, the GPS took us on a left hand turn, looked dodgy but we could see the town ahead. Road ran out, no way to cross the river, thick mud – yes of course we had Boris washed the day before. Maps.me to the rescue and we made our way to town. 4 miserable hours to do 50 kms. Never, ever go anywhere with only one GPS, always have back up! We also have a map but, because of the scale, it was pretty useless. 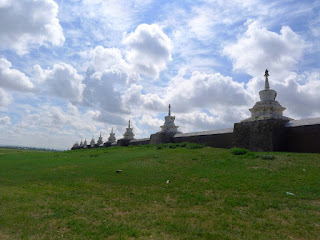 Anyway, we made our way Erdene Zuu Monastery, the aim of this journey. 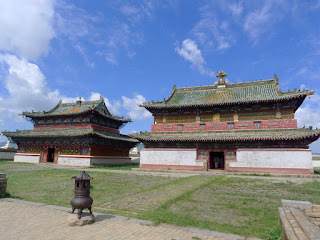 A wonderful complex but not much else to see in town so we drove east to Ulanbaatar. 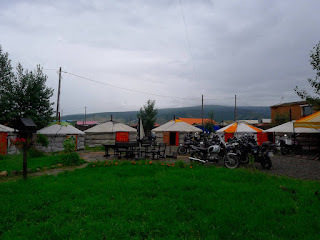 Bernard told us of a fab travellers hostel, so we headed to that, hoping to meet up with Ken and Carol that we’d met in Ulan Ude (the Aussie bikers). Oasis hostel turned out to be absolutely brilliant and we met up with Ken and Carol. We stayed much longer than planned as we loved the atmosphere, the showers, the café (real food and wine), the people we met. In fact, we stayed so long that Bernard turned up again. We had a great time. However, we felt that if we didn’t head off on day 5, we might never leave. Off we went, but had noticed that the domestic battery wasn’t holding a charge well. Never mind, she’ll be right. 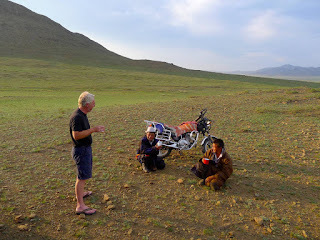 We took the paved road east to Undurkhan and then went off-piste, towards Choibalsan with an overnight stop in the wilds. We noticed that there was no traffic on this road and then came the slow realisation that the longer, southern road must be paved. Bugger, too late to turn back. And we were right, after 330 kms of miserable, horrible, hateful roads, we found out that the southern road was definitely paved. Rats! North from Choibalsan to the border is definitely unpaved. With the wisdom of 20/20 hindsight, we would take a completely different route. 560 kms of misery but a definite sense of accomplishment (says Lawrence – not moi). Yeah, yeah, one must expect bad roads in this part of the world, but really – enough is enough. And, you guessed it, the battery gave out completely. Which of course means, no fridge, no water pump (no water), and no lights. As it’s light until 10 pm that was no problem, but of course our toilet needs power. TMI alert! We can operate the valve manually and use bottled water to flush. However, I didn’t quite close the valve properly (it’s quite hard) and with all the corrugations and bumps the valve opened up a bit more and you can guess the rest. As they say – ‘sh*t happens’. Not the best part of our journey. Finally made it the border – it’s a real outpost. We were the only ones there, but it took 2 ½ hours. First up the Mongolians fined us for not having a temporary vehicle import document (their mistake), then they found Lawrence’s UK passport and this caused a ruckus, having 2 passports. Another small ‘fine’ fixed that. Then the bloody Russians wanted to search our outside locker and other bits and pieces. We were really over it by the time we had our late lunch (no breakfast) and were desperate to find somewhere to park for the night. But of course our GPS led us on a merry goose chase and more bad bloody roads. 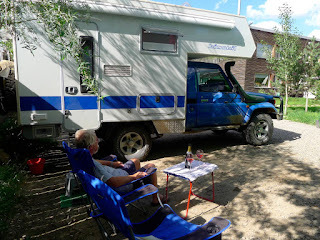 Finally we found somewhere to camp. Our map is just not detailed enough to help much. We are now in Chernyshevsk and staying in low-key hotel for 2 nights. We needed a day off from driving. This is the kind of town where you would slit your wrists rather that live here. But it has hot showers and a decent bed. The café of course isn’t open Saturday and Sunday nights and we can’t find another place to eat anywhere. Tonight we are having cheese, toast and wine. Anything but a repeat of the ghastly pizza we had last night. And the gin supply has run out. When you enter Mongolia, make sure you get a temporary importation document for your vehicle (we didn’t). You may need to insist, as the process is shambolic. 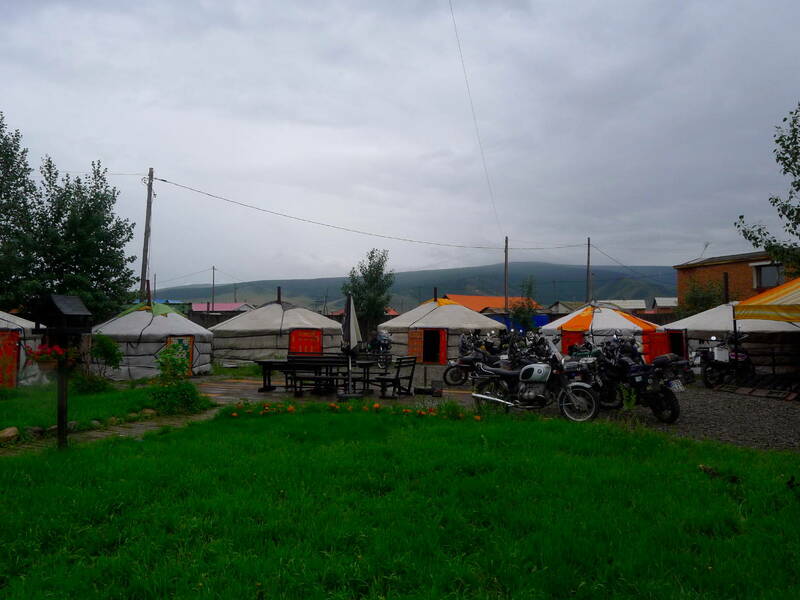 Oasis hostel in Ulanbaatar is one of those places where any bikers in Mongolia eventually find themselves. It has everything you need. Hot showers, café with good food, beer and wine. A laundry, a hairdresser(!) and places for 3-4 campers to park (not tents though). It has 6 Gers plus rooms and dorms. We stayed 5 days and ate in the café 3 x per day. The bill came to about 200 USD for all this including beer and wine – amazing. If you are thinking about taking the border crossing we took – think again. 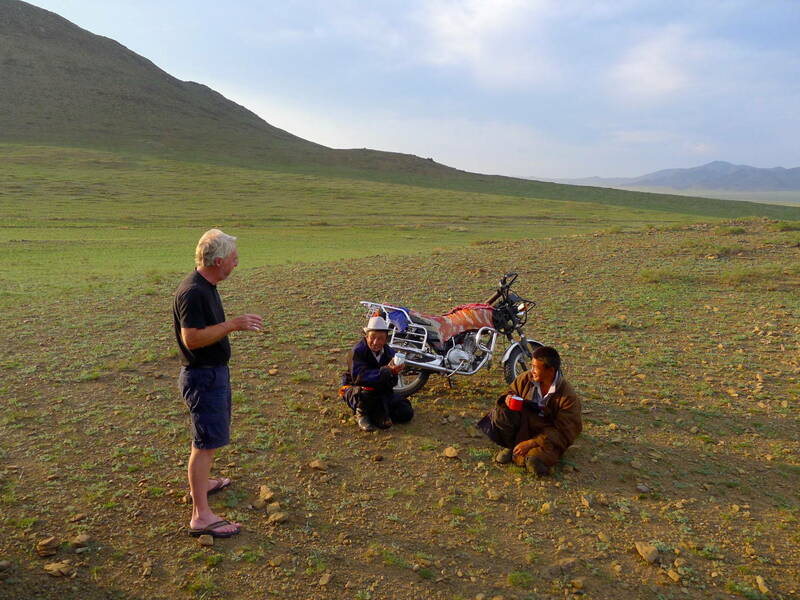 However, if you do it the southern road to Choibalsan via Baran Uurt is paved – take it, trust me. After that is awful. About 18kms before the border town of Ereentsay, you need to cross the railway. Don’t miss this left hand turn (we did). The border crossing is on the western side of the railway. This road is a bit like a goat track. You need to cross the river which has steep sides but not much water when we were there. Once in town, make your way through the maze of dirt roads to the river. The bridge is buggered so you need to use the ‘causeway’. Just pray is hasn’t been raining too much. The border is about 1 km from there. If you are heading to Borzya (and you will) the road is awful. 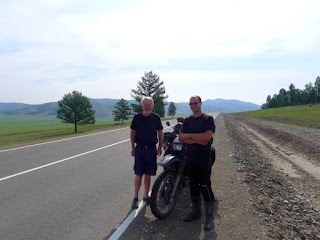 If you are heading east from there, consider going the long way through Chita as all the back roads are unpaved, and you may have had a gutful by then! Aah, the wisdom of hindsight.